We were looking at online wedding costs for last week's Finance Fridays. This week sees the old pound coin being withdrawn and in theory you shouldn't be able to spend it in shops within a couple of days but will you still be able to? Even before the new pound coin was introduced it was felt that many businesses wouldn't be ready in time for the changeover so what is the current situation? On 28th March this year the new 12-sided pound coin became legal tender. It had already been decided that the old round pound coin would cease to be legal tender at midnight on 15th October 2017. However the changeover process has been fraught with problems. With less than seven months for businesses to change machines and around 450 million round pound coins estimated to be still in circulation it seems that 15th October is a date that will arrive too soon. With many vending machines, parking meters, ticket machines, luggage lockers and shopping trolleys still not converted to take the new pound coin certain large retailers have launched a fightback this week. Tesco will be giving their customers another week after the deadline to spend their coins. 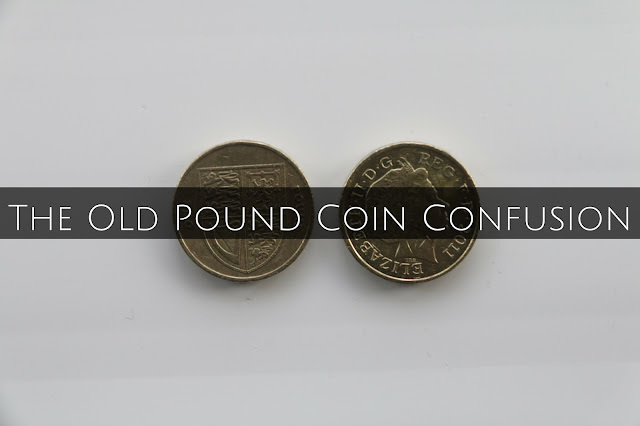 Aldi have said they will accept the old pound coin until 31st October and of course Poundland have extended their cut-off to the end of the month as well. They can do this as the Royal Mint will accept the large quantities of coins they will be sending back to them as their aim is to get all the remaining coins out of circulation. One of the main reasons the new coin has been introduced is that it is thought that around 25% of the round pound coins are counterfeit. The good news is if you find some pounds coins after 15th October you should be able to take them to your bank and pay them in or exchange them. I did ask in NatWest this week how long they would be taking the old pound coin and the assistant replied, “Forever, unless we are instructed otherwise.” She also said that people still come in with pound notes which they change for them. The pound note was withdrawn in 1988! Indeed while I was waiting in there someone came in with an old £5 note which one of the assistants took it off her before she had the chance to join the queue and swapped it for a new one. This also shows you don't need to have an account with a certain bank in order for them to change the money. Before you do go rushing to spend or change your old pound coins have a look to see what design is on them. Since the pound coin was first introduced in 1983 there have been 24 different designs minted. Most coins are only worth their face value of £1 but some had a very limited circulation and are worth far more to coin collectors. Two of the rarest ones were issued in 2011 depict Edinburgh and Cardiff on the reserve. Have you got any old pound coins left? Do you plan on spending them or keeping them? If you want to join in with this week's Finance Fridays then add your link to the linky below. Any post concerning financial matters is allowed. Full details here. It doesn't have to be published today as you have until 23.55 on Tuesday 17th October 2017 to join in.